HARRISBURG, PA - June 23, 2016 - The PNHS Foundation, a 501(c)(3) organization, is ramping up plans to build its base to expand financial assistance to the groups it supports and to raise awareness of the Foundation in the horse community. Founded in 1999, the Foundation has supported youth and equine activities including many horse rescue and equine therapy groups. Therapeutic Riding Championship and Therapy Horse of the Year award. Riders will work to qualify this summer by showing at one of the following local Pennsylvania horse shows: Columbia Riding Club on July 10; Benefit for the Shining Stars Therapeutic Riding Program on August 6 at the Gettysburg Riding Club; and Leg Up Farm Horse Show on September 10 at the farm in Mt Wolf. All riders who participate in the designated classes at one of these shows will be invited to ride at the Pennsylvania National Horse Show. "We are excited to give these riders a venue as special as the Pennsylvania National Horse Show to showcase their skills. A highlight of our Championship will be honoring a Therapy Horse of the Year," said Rebecca Kinsley, Director of the Foundation. A kick off to the fundraising campaign will take place with a PNHS Foundation Trail Ride, held on August 14, 2016, in York, PA, at South Branch Farms. Therapy groups are invited to attend as well as other horse enthusiasts from all equestrian disciplines. Information on registering for the Trail Ride will be available at www.panational.org. 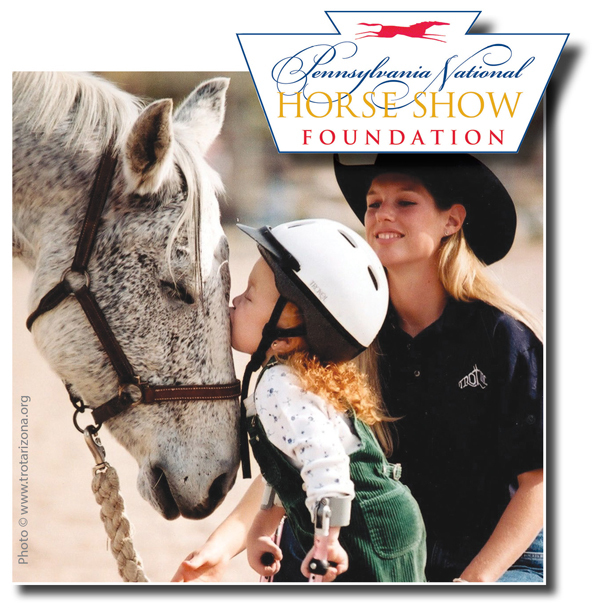 In addition, tax deductible donations can be made by going to the horse show website at www.panationl.org and click on the KICK IN button on the home page (or click here!). "We are excited to launch this new fundraising and awareness initiative that will ultimately provide support to many worthy facilities in the local community, as well as outstanding programs across the United States. It is great to visit these facilities and watch all the wonderful things that take place there and know that we played a part in making it happen," said Kinsley. In 2015 the PNHS Foundation awarded grants to: Beyond Wishes Therapeutic Riding Program, Buffalo Therapeutic Riding Center, Capital Area Therapeutic Riding Association, Chasing Rainbows, Days End Farm Horse Rescue, Equi-librium, Inc., Glade Run, Hope Springs Equestrian Therapy, Inc., Horses & Horizons Therapeutic Learning Center, Ivy Hill Foundation, Leg Up Farm, Mane Stream, Minis and Friends South Plains, Quest Therapeutic Services, The Retreat at Beckleysville, Riding for the Handicapped of Western PA, Sebastian Riding Associates, Seven Star Horse & Family Center, Shady Hollow Assisted Riding, Slippery Rock University, Sojurn Therapeutic Riding Center, SPCA of York County, Special Equestrians, Thorncroft Equestrian Center. The Pennsylvania National Horse Show has also had a long standing relationship with the Kiwanis Club of Harrisburg. Since the horse show's inception in 1945, in excess of $1.6 million dollars has been donated to the Harrisburg Kiwanis Youth Foundation. The PNHS Foundation was established in 1999 as a tax-exempt, non-profit 501(c)(3) organization for the purpose of supporting projects and programs which focus on the education and training of persons in equestrian endeavors. Goals include the support of therapeutic riding programs and the education of equestrian experience for safe and fun riding practices. Applications for grants are accepted throughout the year with action upon requests awarded in September. For more information on the Pennsylvania National Horse Show, visit www.PANational.org.